Reissues can often provide a sober pause to reflect on an album that may have been unnecessarily gushed over or scorned upon its release and gives a potentially fresh audience another chance to rediscover a back catalogue gem from a band who have been recognised for greatness since it first came out. So how has ‘Enemy Of The Sun’ stood up to the test of time since it was unleashed on an unsuspecting world? Here the answer is fairly obvious. 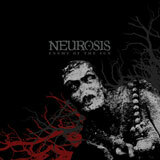 In the 23 years since the Oakland based Neurosis produced ‘Pain Of Mind’ they have become Alt-Rock royalty, towering above their peer group – actually come to think of it, what peer group? They left everyone in the dust so long ago it is hard to think back to bands you would describe as their contemporaries…They have outstripped practically everyone in terms of pushing the boundaries – both sonically and visually – of heavy music further and harder than any other act, prompting Jose Carlos of Terrorizer to describe them in 2009 as ‘arguably the most influential band of the past two decades’. Repackaged to celebrate 25 years of their existence, re-envisioned by their own live visual artist Josh Graham and retaining the two extra tracks from the first 1999 Neurot issue, this version ensures the artwork is as essential as the music, keeping the quality to their usual high standards – the mouth watering visuals compliment the starkness of the soundscapes contained on the disk. As an entry point into the band this would serve as a great place for the uninitiated to join the Cult of Neurot, with the production faultless and the song writing as mammoth and challenging as anything the band have produced. The 17 years that have elapsed since its appearance have not dulled the impact of this record. The pounding tribal rhythms, the crushing doom and the jarring folk passages all clash harshly with the band’s post metal/post punk experimentation. Long gone are the Bay Area thrash leanings of their first record, the opening strains of ‘Lost’ and it’s haunting, ominous atmospherics are light years ahead of anything released at the time and to this day set the bar higher than most bands will reach in a life time. Mournful lyrics collide with yelps and growls, samples and an almost kitchen sink variety of musical instruments including didgeridoos, horns and violins. ‘Raze The Stray’, ‘Cleanse’ and the monumental title track itself are as mesmerizing, as encapsulating and as haunting as they were when first released. I could wax lyrical all day about Scott Kelly and Steve Von Til’s guitar and vocal interplay, Dave Edwardson’s multi instrumental contribution, Jason Roeder’s drumming or Noah Landis’ work, or their many and equally challenging side projects but frankly if you don’t know what I am talking about, stop reading, Google ‘Neurosis’, check out ‘Through Silver In Blood’ or ‘Souls At Zero’ and come back when you are better prepared. It is easy in this day and age to write off the progress made in heavy post metal/rock music with artists like Mastodon challenging fresh perceptions, but they are in essence standing on the shoulders of giants. This release is epic, harsh, experimental and anguished, often like having the rug pulled from under you whilst being simultaneously punched in the stomach and kicked in the head. ‘Enemy Of The Sun’ leaves you reeling long over the disc has stopped spinning. Widely regarded as the record that changed everything for doom/sludge/dirge/art rock, this album has it all – from brutal riffing to quiet contemplation and has earned it’s right to be hailed as a monumental release, standing amongst the best releases not only for Neurosis but for the genre as a whole.